Plan seeks to demo 7, 27 Spring St. The Delaware Historic Preservation Commission informally reviewed Wednesday a proposal by Indus Hotels to demolish and construct a hotel at 7 and 27 Spring St., which is zoned B-3 Community Business District. Pictured is the proposed site of the hotel. As the Wesleyan Inn proposal currently goes through City Council, the Delaware Historical Preservation Commission (HPC) held an informal review of another proposed hotel, this one a Hampton Inn that would be constructed on 7 and 27 Spring St. 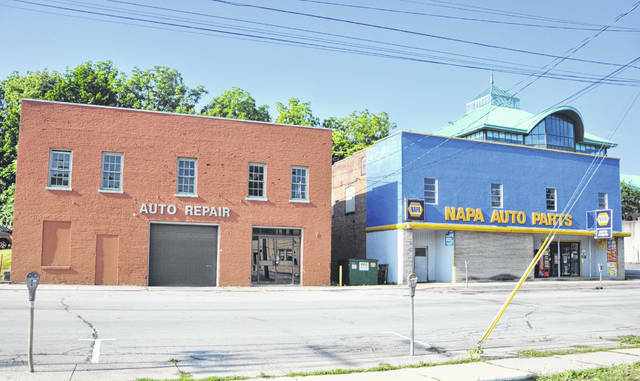 The two existing buildings on those locations — a former auto repair shop and a NAPA auto parts store — would be demolished to make way for the hotel. Details discussed at Wednesday’s meeting included conceptual plans for a six-story building that would include approximately 118 rooms. At 70 feet tall, the hotel would be considerably bigger than any other building in the district. Per the city’s guidelines, the applicant would need to design the building to be compatible with existing nearby buildings, including the materials used and the color palette selected. A white brick and stone building design was proposed in the informal review, with city staff recommending the brick be red to blend with the rest of the district. Per the proposal documents, a cornice was also suggested by city staff to “soften the more modern appearance of the hotel to allow it to better blend into the district.” The cornice on the former Allen Hotel building, now the PNC Bank on the corner of Sandusky and Winter streets, was used as a reference. Planning and Community Development Director Dave Efland said it would be recommended that the site is rezoned to be included in the downtown core district rather than the transitional subdistrict, which it currently sits in. Parking for the hotel would include both existing street parking spaces as well as the addition of two proposed lots on the opposite side of Spring Street. Asked about the potential for parking behind the hotel, Efland said given the building’s footprint, that would not be an option. Naturally, when the HPC commissioners weighed in on the proposal, a prevailing concern was how the building, as it was currently designed, would fit in — or not fit in, in this case — with surrounding buildings and the downtown core. In addition to his thoughts on the potential rezoning, Coleman said he didn’t believe the rendering of the hotel is an actual nod to the Allen Hotel, calling it a jarring contrast to the rest of the district. Cara Hering, attending her first meeting as the newest commissioner of HPC, said she was okay with and interested in the color palette, stating her opinion that part of what makes downtown Delaware vibrant is the variety in details from storefront to storefront. With the meeting to discuss the proposal simply being an informal review, no formal action was taken. HPC will revisit with the Indus Hotels group in the coming months to continue what is sure to be a lengthy process that would have to include Planning Commission approval and, ultimately, approval from city council.